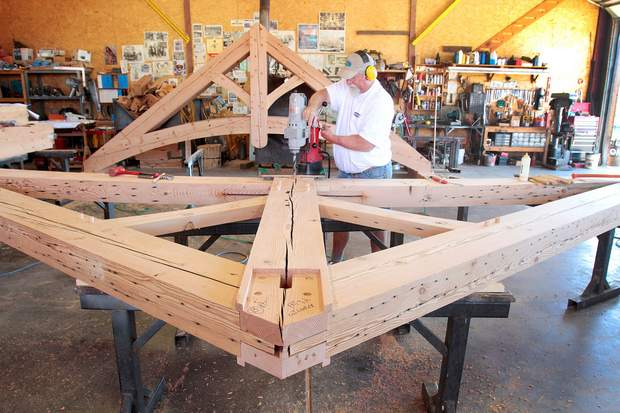 Thousands of timbers and planks salvaged from demolition in distant places find a second life in timber framing material at San Juan Timberwrights. Timber framing came to the country with early settlers. Using axes, draw knives and brace and bit, they united heavy timbers with pegs and mortise and tenon joints to erect houses and other buildings. Oldtime barn raisings in which the community turned out to lift entire walls into place exemplify timber-frame building. The style of construction lives on, but, today, the heavy lifting is done by machines. On Tuesday, at a house under construction along the Florida River northeast of Durango, CO, a crane lowered a 1,200-pound truss to a team that muscled it into place and drove home the pegs. The end products are mainly trusses and beams sawed and planed from stacks of timbers that dot the yard. One pile is composed of 16-inch by 34-inch, 50-feet-long behemoths that once were part of an auto dealership in Portland, Ore. Most Timberwrights clients are contractors. But the shop also cuts timbers for individual custom orders. “We try to keep a variety of miscellaneous wood on hand,” McDowell said. The Oregon State Mental Hospital in Salem where the 1975 movie “One Flew Over the Cuckoo’s Nest” starring Jack Nicholson was filmed. Buildings taken down in Vancouver, B.C., to accommodate the 2010 Winter Olympics. A Paul Masson winery in California. Boeing’s Plant 2 in Seattle that produced B-17 bombers during World War II. The roof was camouflaged with life-sized trees, buildings and streets to deceive potential Japanese planes. The Long-Bell Lumber Co. mill in Longview, Wash., where its cabinet division spread over more than 20 acres under one roof. McDowell, his wife, Tammy, and her brother, Doug Wakefield, founded the corporation in 1986. The McDowells work here; Wakefield is a one-man operation in Norwood. They started using seasoned timber from salvage jobs in 1990. “We used to build with green timber, but in time it can twist and create space in joints,” Mike McDowell said. 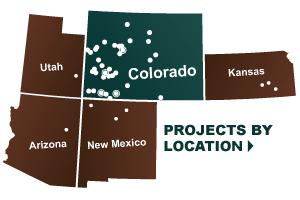 The Pacific Northwest supplies most of the timbers used by the McDowells, but they also buy lumber in Boston, New York City or the Midwest. “The West Coast is a big supplier because that was the building material most plentiful there,” McDowell said. When the Durango Railroad Historical Society bought planks for framing and siding a dilapidated high-side gondola the club is restoring, the McDowells loaned a covered shed for the project. Under the guidance of Dennis D’Alessandro, the work will be finished next summer, a year after restoration began. The McDowells deal primarily with one wood broker. Between visits they may receive photos of potentially interesting selections, she said. Blemishes in timber such as cracks, knots, nail or bolt holes – evidence of prior use as it’s known in the trade – are part and parcel of timber framing. San Juan Timberwrights is among the 1,400 members of the Timber Framers Guild, which has international reach. The timber framing trade is starting to recover from the throes of the economic slump three or four years ago, administrative assistant Susan Norlander said by phone from the guild office in Alstead, N.H. The guild, with members in Scandinavia, France, Germany and Japan, publishes a quarterly journal and a newsletter eight times a year. Three conferences are held annually – one on either coast and one in the East for people interested in historical timber-frame buildings. As part of its educational mission, the guild coordinates community projects, Norlander said. The current one is a picnic pavilion in Frankfort, KY, where prison inmates are doing the timber framing. “We make sure projects are for nonprofits or a municipality and that they don’t take work from a timber framer in the area,” Norlander said. Click here to read article in The Durango Herald.